Snow has arrived and the holidays are fast approaching. For local shopping and a good time, come and celebrate the season at the Mabel Tainter’s 15th annual Fine Arts and Crafts Fair. 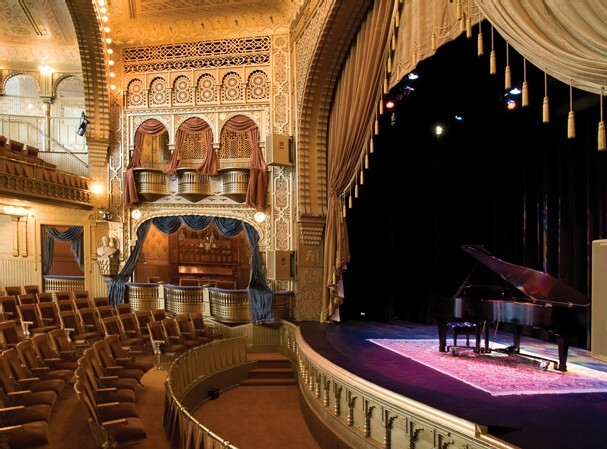 The Mabel Tainter typically hosts plays, musicals and concerts, though the center offers outreach programs as well. However one of the most popular events held by the Mabel Tainter is its yearly Fine Arts and Crafts Fair. The Mabel Tainter Center for the Arts is a 125-year-old historic building in downtown Menomonie. This structure was erected in 1889 to honor the life of Andrew Tainter’s early passing daughter. Tainter, a lumber baron, knew his daughter was fond of music and the arts so he and his wife commissioned the building in her memory. Since then, it has served as an architectural relic and a haven for the performing arts. The fair itself is a bustling hive of activity. Nearly 40 vendors and craftspeople from all disciplines come to market their specialty goods. Pottery, jewelry, paintings and glass-blown art are just a sample of the mediums present here. The event is largely popular due to its placement in the year. “A lot of people love this event because they come and get all their Christmas shopping done,” Reise said. The interior of the facility will also be adorned with Victorian Christmas decorations as a seasonal touch. Don’t miss the chance to experience this historical building in all its splendor while supporting local artists at the same time. The best part? It’s free. The Mabel Tainter 15th Annual Fine Arts and Crafts Fair is on Nov. 22 from 10 a.m. to 5 p.m. The building is located downtown on 205 Main St. E.